Led by American swimmer Michael Phelps and sprinter Usain Bolt of Jamaica, athletes broke 43 world records and 132 Olympic marks during the Beijing Games. Phelps rewrites the record book — American swimmer Michael Phelps went where no Olympian ventured before. 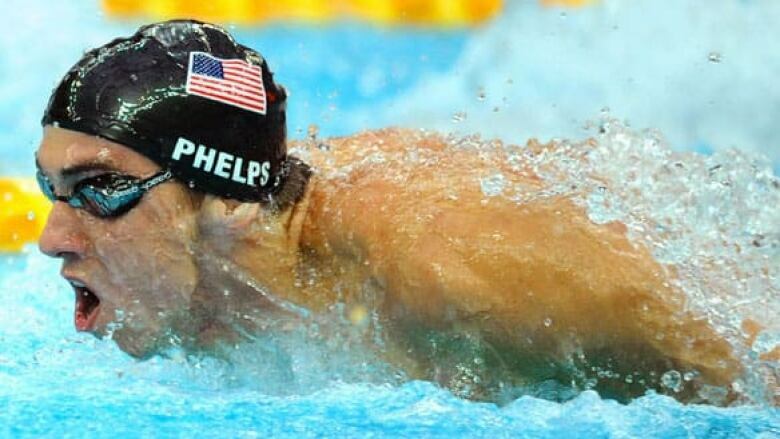 Phelps swam to his record eighth gold medal of the Beijing Games on Day 9, propelling the U.S. team to a hard-fought victory in the 4x100 medley relay. Phelps's eighth win in as many events bumped fellow American Mark Spitz off the pedestal he had occupied since the 1972 Olympics. Spitz captured seven titles in seven races in Munich, a feat many said couldn't be topped. "Everything went as planned. Everything went as I wanted to," Phelps told CBC Sports. "I couldn't have asked for anything different. It's a dream come true." Lightning strikes for Usain Bolt — Usain Bolt danced in front of television cameras and a stunned crowd of more than 90,000 at the Bird's Nest in Beijing after smashing his second world record of the Games and blowing away the field. A new sprint king was crowned. Bolt produced the first sprint double the world has seen in 24 years, and for the first time in history, won both the 100- and 200-metre events in world record time. "After I finished running the 100 metre, I was saying, 'This is possible,'" Bolt told CBC Sports. "If I'm going to break it [anywhere], it's going to be here because the track is quick." He went on to set another world record with the Jamaican men's 4x100 relay team. Three events, three gold medals, three world records. No one came close to catching the "Lightning Bolt" from Jamaica. Gold-medal redemption for Canadian men's eight — The men's eight rowing team finished the job they started four years ago by winning a gold medal in China. Canada led wire-to-wire in the final, finishing in a time of five minutes, 23.89 seconds. The men's team consisted of Ben Rutledge of Cranbrook, B.C., Kevin Light of Sidney, B.C., Malcolm Howard of Victoria, Andrew Byrnes of Toronto, Jake Wetzel of Saskatoon, Dominic Seiterle of Victoria, Adam Kreek of London, Ont., and Kyle Hamilton of Richmond, B.C. Lamaze takes hard road to equestrian glory — "Lamaze-ing." The headlines in Canada's print media may have been pedestrian (even groan-inducing), but there was nothing ordinary about the man they referred to. 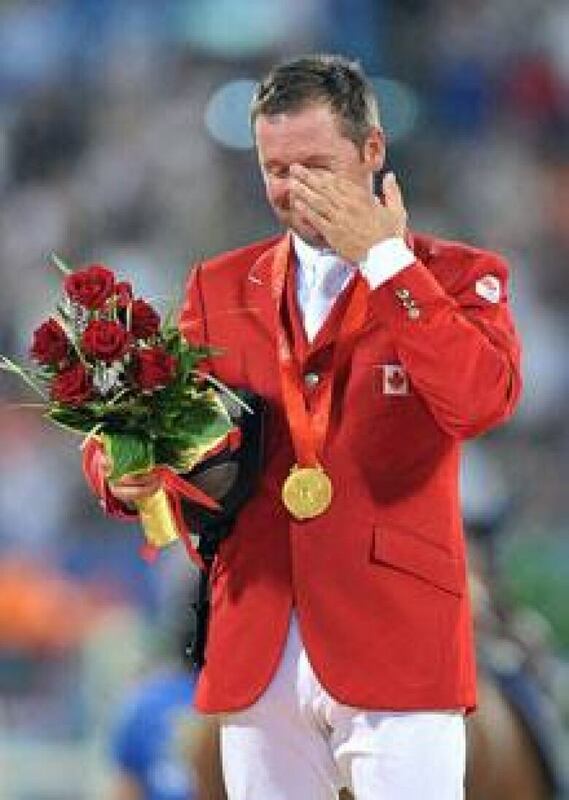 A former cocaine user twice booted from the Canadian Olympic team for failing drug tests, Eric Lamaze completed his long quest for redemption by winning gold in individual show jumping. Riding his superb horse Hickstead — perhaps Canada's finest mount since Big Ben — Lamaze defeated Sweden's Rolf-Goran Bengtsson in a jumpoff to earn Canada's third gold medal of the Beijing Games. "When you give people chances and allow them to come back from their mistakes, great things happen and I'm a perfect example that you shouldn't give up on people," said an emotional Lamaze. It was the second medal for the Olympic rookie, who earlier helped Canada to silver in team show jumping. Record-setting relay for Australia — Australia's vaunted freestyle swimmers had no peer in the 4x200 relay final, vanquishing the previously unbeaten Americans and smashing their world record by almost six seconds. Stephanie Rice, Bronte Barratt, Kylie Palmer and Linda Mackenzie combined to claim the gold medal in 7:44.31, lowering the world record of 7:50.09 set by the United States at last year's world championships in Melbourne. "It was so exciting," Rice said. "This is mine and Bronte's last Olympic event [at Beijing], so what a great note to finish on." Yang Yu, Zhu Qianwei, Tan Miao and Pang Jiaying of China took the silver (7:45.93), and the U.S. earned the bronze (7:46.33). The Americans, represented at these Games by Allison Schmitt, Natalie Coughlin, Caroline Burckle and Katie Hoff, had prevailed in every Olympic final since the 4x200m relay was introduced at the 1996 Atlanta Games. Russia's Isinbayeva wins gold, sets pole vault world record — Yelena Isinbayeva of Russia broke her own world record in winning a second consecutive Olympic pole vault gold medal. With the gold medal already secured, Isinbayeva set the mark of 5.05 metres in her third and final attempt at that height in the final. After eclipsing her old record by one centimetre, Isinbayeva did a somersault on the mat before jogging around the track with a Russian flag. In total, Isinbayeva has set the pole vault mark on 23 occasions during her career. South Korea goes 9-0 to win Olympic baseball gold — Seconds after Chong Tae-hyon's final pitch that secured an Olympic gold medal for the South Korean baseball team, 23 of his teammates stormed the mound in jubilation. Chong induced Cuban second baseman Yuliesky Gourriel to ground into a double-play with the bases loaded in the bottom of the ninth inning, putting the finishing touches on a 3-2 win at Beijing's Wukesong Baseball Field. Korea wasn't considered a medal favourite in the men's tournament, but went unbeaten in all nine of its games to win gold in its first-ever appearance in the Olympic final. 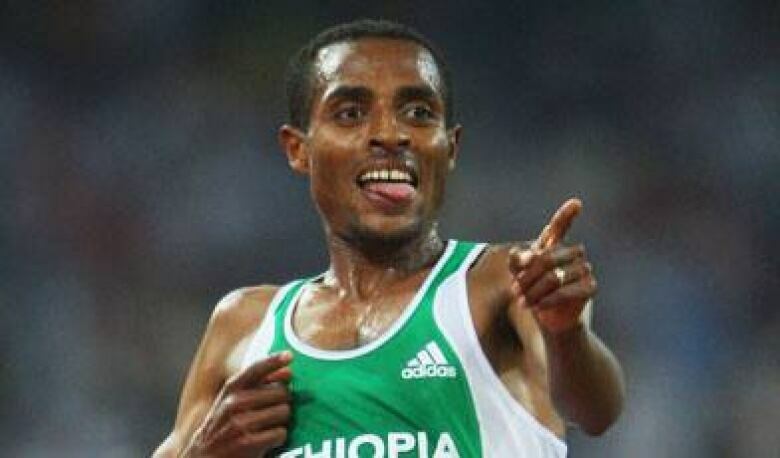 Double-double gold for Ethiopia — Kenenisa Bekele of Ethiopia was masterful in the men's 5,000-metre race on Day 15, winning his second gold medal of the event in Olympic record time. Bekele crossed the line for the win in 12 minutes, 57.82 seconds. He broke a 24-year-old Olympic record by more than seven seconds. The previous week, Bekele won gold in the 10,000, setting an Olympic record in that race as well. He now has four medals in his career, after winning gold at the 2004 Athens Games in the 10,000 and settling for silver behind legendary runner Hicham El Guerrouj of Morocco in the 5,000. Countrywoman Tirunesh Dibaba won the gold medal on Day 14 in the women's 5,000 metres, helping her achieve an unprecedented feat. In a slow race, Dibaba finished in 15 minutes, 41.40 seconds. She won the 10,000 metres earlier in the competition and becomes the first woman to win Olympic gold in both races. U.S. gymnasts finish 1-2 in individual all-around — American gymnast Nastia Liukin won the women's individual all-around title, with stellar performances on all four apparatuses. Compatriot Shawn Johnson won the silver while China's Yang Yilin claimed bronze. Liukin sealed victory on the final event, the floor exercise, and finished with 63.325 points overall. Johnson, the reigning world champion, ended up a half-point back. Liukin and Johnson have been friendly rivals the past two years, with Johnson winning almost everything. Johnson and Liukin have been the world's best gymnasts for two years, and most expected the teammates to be each other's biggest competition. Johnson came in with the momentum, winning every matchup with Liukin but one in the past few years. For China, it was the first disappointment on the gymnastics floor. The Chinese won both the men's and women's team titles, and Yang Wei ran away with the men's all-around gold. But while the Chinese women had the stronger team, it was Johnson and Liukin who were the overall stars. They accounted for nine medals in total, with Liukin losing out on another gold — on the uneven bars — due to a tiebreaker. Chinese divers go 7-for-8 — No country has ever swept the diving events at the Olympics, but the Chinese team came close in Beijing. Matthew Mitcham of Australia kept China from sweeping all eight Olympic diving gold medals when he earned four perfect 10 scores on his last dive to win the men's 10-metre platform final, the final diving competition of these Games. Mitcham earned a total score of 537.95 points in the six-dive final, edging Zhou Luxin of China by 4.80 points. China won the seven previous diving events in Beijing, and Zhou, who led through the first five rounds after earning three 10s on his next-to-last dive, could have made it 8-for-8. But he had a crooked entry on his last dive and had to settle for the silver. Still, the Chinese ended up claiming 11 of the 24 medals awarded in the sport in Beijing.